Home > Dining and Gourmet > Western Food > Tony Roma’s: Enjoy Up to 30% OFF on A la Carte Food Items with EDM! 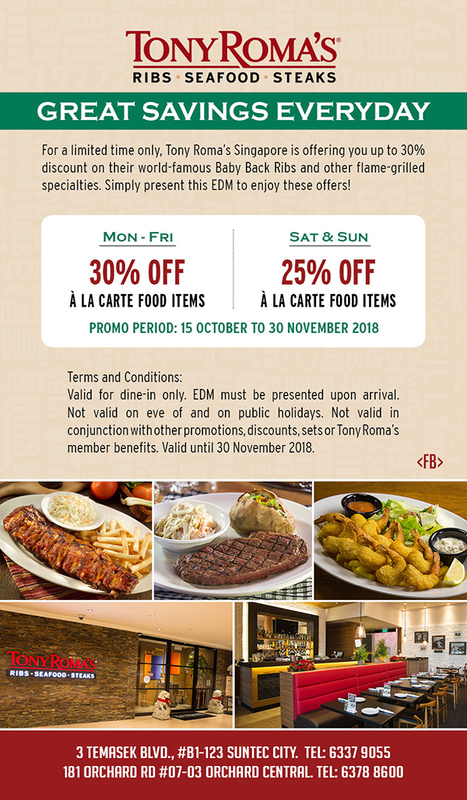 Till 30 Nov 2018 Tony Roma’s: Enjoy Up to 30% OFF on A la Carte Food Items with EDM! Tony Roma's has just announced the closure of their Suntec City branch in Jan 2019. For a limited time only, Tony Roma's Singapore is offering you up to 30% discount on their world-famous Baby Back Ribs and other flame-grilled specialties. Simply present this EDM to enjoy these offers! 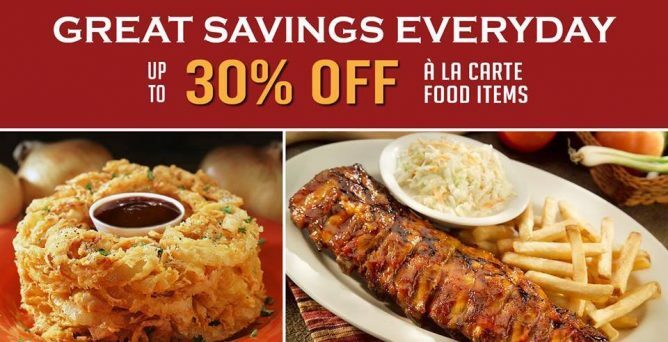 Promotion: Enjoy Up to 30% OFF on A la Carte Food Items with EDM at Tony Roma's! Valid for dine-in only. EDM must be presented upon arrival. Not valid on eve of and on public holidays. Not valid in conjunction with other promotions, discounts, sets or Tony Roma's member benefits. Valid till 30 November 2018.